Arabs conquer Sāssānid Empire (636-651) - The long hard-fought Bynzantine-Sāssānid War came at a most inopportune time for the two participants; just before the Muslim Arabs broke out of the Arabian Peninsula and began conquering the surrounding region. The Byzantine Empire was invaded and lost a significant amount of territory. The Sāssānid Empire fared far worse. For centuries the Arabs had been a loose organization of nomadic tribes which had generally sided with one of those powerful empires to their north. But under Mohammed, and his successors, they were united by the new Islamic faith and determined to spread its message. They quickly organized into the Rashidun Caliphate. Not only that, but they had become powerful enough, not just to take on one of the empires, but both at the same time. Their campaign against the Byzantine Empire is noted above (see Battle of Yarmouk). The Arab invasion of Sāssānid territory began at roughly the same time. Abu Bakr was the Caliph, and Khalid ibn al-Walid was in command of the army. He led about 18,000 troops into Mesopotamia and captured it with little resistance. The Sāssānids attempted a counter-attack, but were beaten badly at the Battle of Kadisiya. That ended their control of Mesopotamia forever. But for the time being, Persia, the heart of the empire was safe. It was separated from Mesopotamia by a natural barrier, the Zagros Mountains. And the Rashidun Caliphate needed all its men for its simultaneous campaign in Byzantine land. In 634, Abu Bakr died and Omar became Caliph. After capturing Syria, and realizing he could not take Constantinople, Omar halted his attack on the Byzantine Empire and turned to Egypt and North Africa. Meanwhile, having lost Mesopotamia, the Sāssānids, perhaps foolishly, conducted raids into their old province. Omar sought to end them and punish the Sāssānids. He ordered his army to cross the Zagros Mountains and invade Persia in 642. The decisive battle took place almost immediately at Nahawānd. 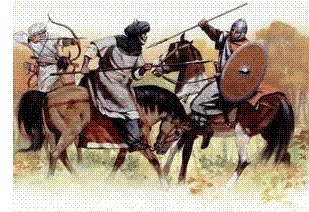 The Arab army crushed the Sāssānid army, opening the way for the conquest of the rest of the empire. The battle is remembered in Islamic history as the "Victory of Victories". Although it would take another nine years to fully control the region, the Persian army was incapable of mounting any kind of meaningful resistance. Yazdegerd III, the Sāssānid emperor went into hiding, but was killed in 651, the same year the empire officially ended. From that point, Zoroastrianism almost disappeared as a religion (although there are still a few hundred thousand adherents to this day), and Islam took over as the dominant faith. However, over the following years, the Persians were able to reassert their dominance over the region. Their language and their culture survived, only their religion changed.